A professional and reliable online gallery providing a variety of Chinese paintings at reasonable prices and shipping them globally. 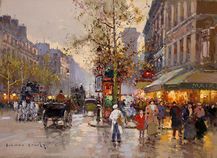 Edouard Cortes was born in Lagny, France on April 26, 1882. During his early lifetime, Paris was the center of the art world. Artist from across the globe traveled there to study and paint it’s beautiful countryside and cities; views of Paris, or as it became known ‘the City of Lights’, were in great demand by both collectors and tourists. édouard Cortès, along with other artists like: Eugene Galien-Laloue (1854-1941), Luigi Loir (1845-1916) and Jean Beraud (1849-1936) answered their call. Specializing in Paris street scenes, each of these artists captured the city during its heyday and continued with these scenes well into the 20th century. Edouard was the son of Antonio Cortès – the Spanish Court painter – who was himself the son of the artisan André Cortès. Antonio was born in Seville in 1827 and established himself as a painter of rural genre. In 1855 he traveled to Paris for the Exposition Universelle and was drawn to the town of Lagny-sur-Marne – where he settled. He continued to paint scenes reminiscent of Troyon, Jacque and Van Marcke. Antonio had three children - Edouard, Henri and Jeanne - and while all had artistic talent, it was édouard who had the passion. Antonio began teaching édouard at an early age and enrolled him in a private elementary school where he continued his schooling until the age of 13. From this point on he devoted his life to art – working and studying with both his father and older brother. In 1899, at the age of 16, he exhibited his first work at the Société des Artistes Fran?ais entitled La Labour. The work was well received by the critics and the public - helping establish Edouard’s favorable reputation in Paris.